Hello everyone! 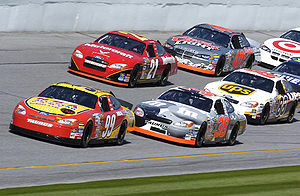 In todays blog we are going to chat about the signing habits of the legends of NASCAR. As a general rule, the stars of yesterday are much better signers than today’s big names. Richard Petty – “King Richard” is an amazing signer. I have never seen him turn down anyone no mater what the situation. A class act! Dale Jarrett – Another class act! He almost always signs without exeception. In all the years, I have only seen him turn down one request. Darrell Waltrip – A very nice guy who is a very willing signer. One of NASCAR’s many good guys. Jimmie Johnson – An amazing signer! He gets huge crowds everywhere he goes but really trys to sign for everyone! Jeff Gordon – One of the few NASCAR drivers that can be somewhat difficult. He will sign but you have to catch him at the right moment. Terry LaBonte – Another good guy who always seems to sign for everyone he can. Very consistant and super nice. Kevin Harvick – A fantastic signer! I can honestly say that I have never seen him turn down and autograph request! Geoff Bodine – A very good, consistant signer. He is very polite and goes out of his to accomodate his fans. Ricky Rudd – can be challenging as a signer. Generally a nice guy but dosn’t sign a lot. Bill Elliott – Can be very tough. I have seen him turn down many autograph requests. I have never seen him act in a rude or disrectful way but, I havn’t witnessed him accomodating a lot of fans. This entry was posted in Autograph Shows, autographed cachets, autographed fdc, autographed first day covers, Autographs, book signings, Celebrities, Collectibles, Hobbies, Signatures, signed cachets, signed fdc, signed first day covers, Uncategorized and tagged bill elliott, Brian France, brickyard 400, Dale Jarrett, Darrell Waltrip, daytona 500, Geoff Bodine, jeff gordon, jimmie johnson, Kevin Harvick, NASCAR, Richard Petty, Ricky Rudd, terry labonte. Bookmark the permalink.